The United States is observing the impacts of climate change in every region and across economic sectors. Farmers and ranchers across the Great Plains battle drought, transportation planners consider how floods might affect roads and bridges, and utility managers try to keep the electricity flowing during heat waves. The Fourth National Climate Assessment (NCA4), released November 2018 analyzes the effects of climate change on the environment, economy, human health and reports the trends in global change with projected major trends for the coming decade through the end of the 21st century. The report also looks at how society is responding to a changing climate and identifies actions we can take to prepare. The report assesses climate risks to human and natural systems and presents measures that can be, or have been, taken to minimize risk. Each chapter is focused on what is at risk in each region or sector with recommendations and case studies about how to manage that risk. The NCA can be a useful tool for public and private sector decision-makers trying to address climate challenges. The Fourth NCA was released in two volumes. 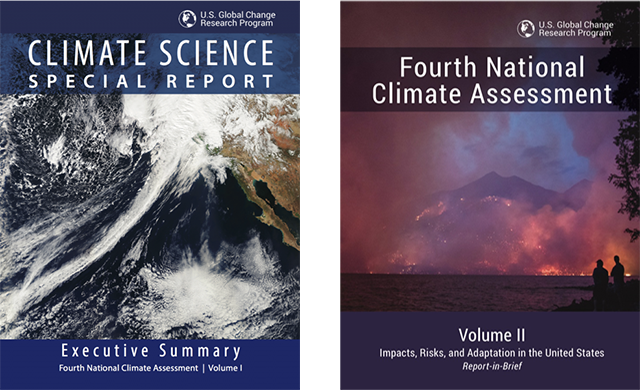 Volume I, the Climate Science Special Report (CSSR) was released in November, 2017 and provides an overview of current climate science findings, discusses uncertainty and analyzes climate trends. Volume II, Impacts, Risks and Adaptation in the United States, was released in November, 2018 and delves into the implications of the science for human welfare, society, the environment, and how that varies across ten regions and 18 national sectors. We have observed the impacts of climate change for decades and that more frequent and intense extreme weather and climate-related events are creating new and increasing risks across U.S. communities. Climate change poses risk to health, ecosystems, agriculture, infrastructure and economically and socially vulnerable populations. This growing risk of extreme and climate-related events will cause growing economic damage and losses to infrastructure and property and will impede economic growth. There is great need for greater study and anticipation of cascading failures triggered by extreme or climate events. Observed climate impacts on complex natural, built and social systems expose considerable vulnerabilities to these interconnected systems. Governments and businesses must act now to rapidly reduce emissions and avoid the extreme climate impacts projected in the highest emissions scenarios, and to invest in adapting to existing climate impacts and those expected in the coming decades. The report includes recommendations for climate action to help the U.S. reduce its near and long-term climate change risk. The report is divided into several sections. We provide links to these portions of the report and a short description of each. Overview and Report Findings: Summarizes the assessment and the 12 top-line messages of the report. Our Changing Climate: Explores observed and projected climate change at the global and national scale. Discussion focuses on physical changes, such as temperature, precipitation, and sea level. Observations tend to cover the last 50 to 100 years, while projections extend through the 21st century. Many maps and graphs in this section are referenced throughout the report. Regional Chapters: Provide localized information in greater detail than the national topics. The regional chapters assess current and future risks in each of the ten U.S. regions in the report. Sector Interactions, Multiple Stressors, and Complex Systems. Responses: Looks at solutions, as well as the research, data, and tools that will facilitate the implementation of adaptation and mitigation solutions. The Fourth National Climate Assessment has an expanded regional focus to offer more localized information by dividing some regions into smaller areas and drawing on state climate summaries from NOAA and downscaled climate projections. The report highlights a number of emerging topics such as: how climate can affect U.S. international interests (including trade, national security and humanitarian assistance), air quality, and how climate impacts ripple through and disrupt interconnected, complex human and natural systems. NCA4 quantifies the costs and opportunities of climate change where possible. The economic impacts of climate change include coastal damages from extreme weather, losses in labor productivity and impacts to human health. The report shows that considerable climate impacts and economic damages expected by the end of the 21st century could be avoided through aggressive near-term greenhouse gas emissions reductions. How is the report assembled? The NCA is based on the findings in peer-reviewed scientific literature and was compiled and written by 300 authors with diverse expertise and experience. They include academic researchers; local, state, and federal government officials; private sector leaders; and non-profit experts. Their efforts are coordinated by the U.S. Global Change Research Program (USGCRP), a collaboration of 13 federal science agencies. The report was thoroughly reviewed by external experts, the general public, the NCA4 Federal Steering Committee, and by an ad hoc committee of the National Academies of Sciences, Engineering and Medicine (NASEM). Previous assessments were released in 2000, 2009 and 2014. What is the difference between the NCA and IPCC reports? 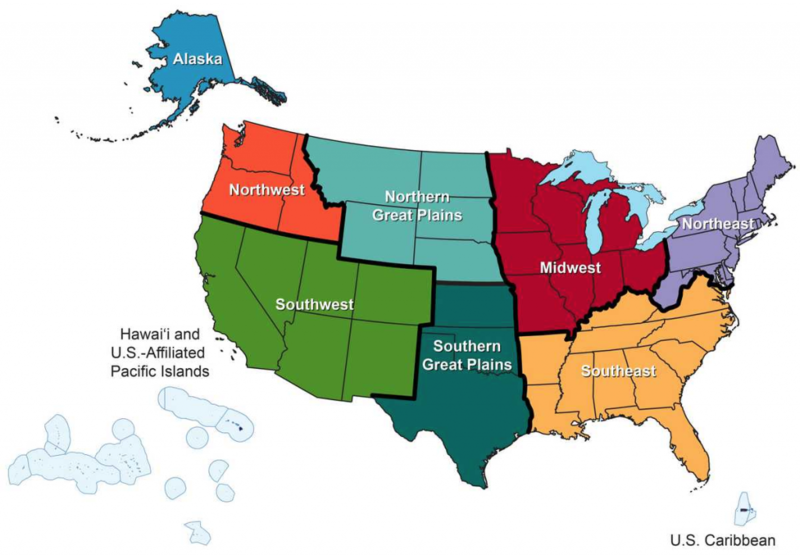 The NCA discusses observed and projected climate impacts in the United States, focusing on eight sub-regions, while the IPCC discusses observed and projected climate impacts at the continental scale. The NCA is subject to review by the National Academy of Sciences, government agencies, and the public. The IPCC is subject to scientific and governmental review.